For a long time now I’ve been looking for a piece of “Canadiana”; something that defines Canada for me as an Upper Canadian and more specifically a Southern Ontarian. The East Coast has its rich nautical history, the West Coast the Indian traditions, the Arctic scrimshaw and gold rush history, French culture and Manitoba has mosquitoes. Sadly unless you are a UEL or an IODE relatively little of our indigenous Ontario history appeals to our sensibilities. On my eternal quest for my definition of Canadiana I noticed that the Toronto Argonauts were holding their annual locker room sale. For those of you that don’t know just before Christmas most of the CFL teams open their locker rooms to sell off excess inventory and it’s a great chance to meet members to the team, staff and cheerleaders. 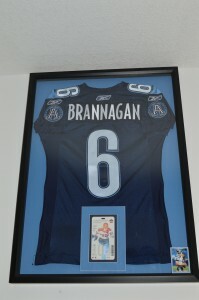 I went to the sale to see if I could find Danny Brannagan’s Toronto Argonauts jersey. What could be more Ontarian then a QB from our own province. I met with the extremely friendly staff and trainers and ask if they still had his jersey. Mike O’Shea helped me with my search through the older items and in the end I was able to find his only blue authentic home jersey in existence. What did I do with it? 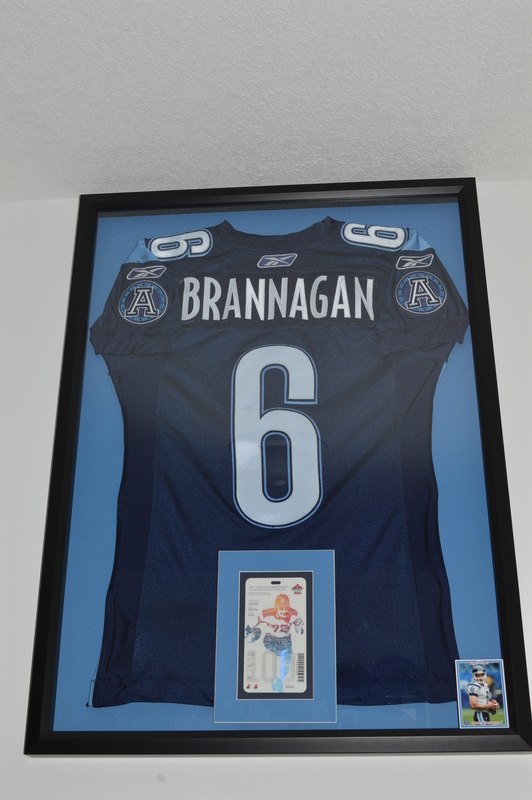 Yes, I know it’s not the 100th Grey Cup jersey and he never got to play in this game but I do think that it’s something unique and local to our part of Canada. I showed someone a picture of the shirt and out of the blue she told me her Uncle played with the Argo’s in the 1930’s winning a couple Grey Cups and collecting several Grey Cup watches for the wins (they didn’t get rings in the 1930’s) and that was her little bit of Canadiana. So for those of you looking for something distinctly Canadian may I suggest a visit to your local CFL team post season locker room sale. You never know what little bit of history you might find. and are in no way affiliated with Argos End Zone. This entry was posted in Argos Archives, CFL, Fan Experience, Photos, Random. I’ve been trying to find a vintage Argos football online but can’t…so far. So I have no idea the worth. Any Idea of what it could possibly be worth…especially if it really is just one of a kind.